Recycling “The Hot Seat” | Sew Lindsay, Sew! The more my fabric collection grows, the more I’m convinced that collecting fabric scraps is equivalent to collecting memories. Tonight I was digging around looking for scraps for the first draft of a new project (yes, a new project is in the works, woo!) and found this memorable scrap. My college roommate and I used it to cover an armchair in our dorm room sophomore year. 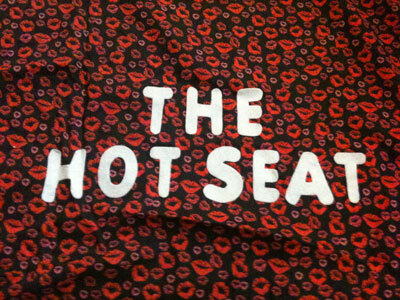 We decided to call it “The Hot Seat” and added the iron-on letters and everything. I honestly don’t know what we were thinking. « Kitchen camping? Yes, please! I love “the hot seat!” And I admire your ability to sew. I picked up some fabric and a pattern (my first) in hopes to make a dress for my daughter’s third birthday. It’s still a number of months away… so hopefully I can pull it off! Growing up, my grandmother did all the sewing in our house. She used to make all her own clothes, without patterns. And they were beautiful. So I truly mean it when I say I envy those of you with sewing talent! Good luck on your daughter’s dress and don’t get frustrated if the pattern is hard to follow. If you have trouble, try following online tutorials… sometimes I feel like they are easier than patterns because they have so many helpful photos! Pingback: Hooked on my nook! « Sew, Lindsay, Sew!